The £250m modern trolleybus project, the first of its kind in the UK could be a complete game changer for BRT in the UK. Featuring 100% electric high capacity vehicles running every 6 minutes at peak times NGT is the brainchild of Leeds City Council and the West Yorkshire Combined Authority. Following a lengthy public inquiry in summer 2014 the inspectors report is awaiting approval from the Secretary of State for Transport the Rt Hon Patrick McLoughlin MP. Fully electric buses have been in operation around the UK, particularly in London for over a decade. They are common place in cities across Europe and in developed nations, many of whom have pledged to reduce their greenhouse gas emissions and improve inner city air quality. Oil production is said to have either peaked or will soon peak after which output and reserves will begin to fall. All this yet still the overwhelming majority of buses in operation around the world run on diesel. Diesel powered trams are a thing of the past and more and more of the UK’s heavy rail network is being ‘electrified’ in order to deliver the benefits associated with electric traction. Is a belated electric bus revolution soon to begin? The signs are promising! In October 2015 the Falkirk based Alexander Dennis group signed a deal with £2bn with the world’s largest producer of electric buses – BYD. The deal followed ADL signing a deal with Transport for London for 51 full electric single deck buses. 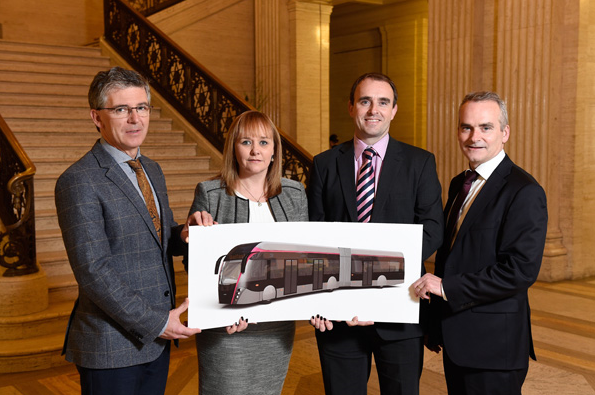 2016 will see the start of this partnership and buses, capable of operating in a range of environments rolling off the production line and into service. 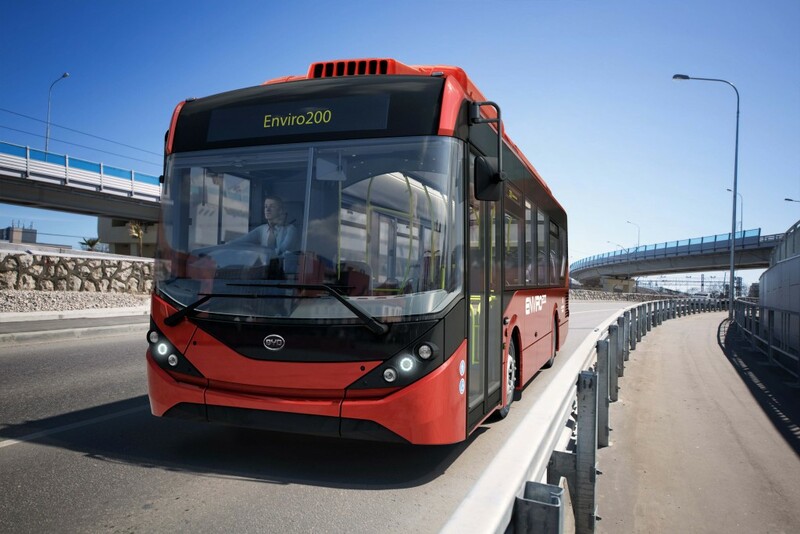 The EU funded Zero Emision Urban Bus System project will see E22.5m spent on 9 electric bus trials across the continent including trials which are already underway in London. A key emphasis is placed on the importance of monitoring and evaluation. Many other UK’s cities will be keeping an eye on these projects and the various technologies employed. BYD has also unveiled a double decker battery powered electric bus, something many experts said would never be possible. Could 2016 be the year battery technology is proven on a BRT related scale? Work started on the three lined BRT route in 2015 with some sections due to be completed in 2016. The Department for Regional Development has awarded Belgium manufacturer Van Hool a £19m contract for 30 high quality, high capacity articulated vehicles which will be used for the BRT operations. For the past 20 years, Greater Manchester has been associated with the Tram. The Metrolink system now stretches over 100km in length with several extensions currently under development. Recent years have also seen Transport for Greater Manchester invest significant funds into BRT and bus priority schemes which complement the Tram network rather than offer an alternative to it. The Greater Manchester Bus Priority package represents the largest investment in the cities bus network for decades with over 25 miles of network being created or improved as part of a £122 programme. 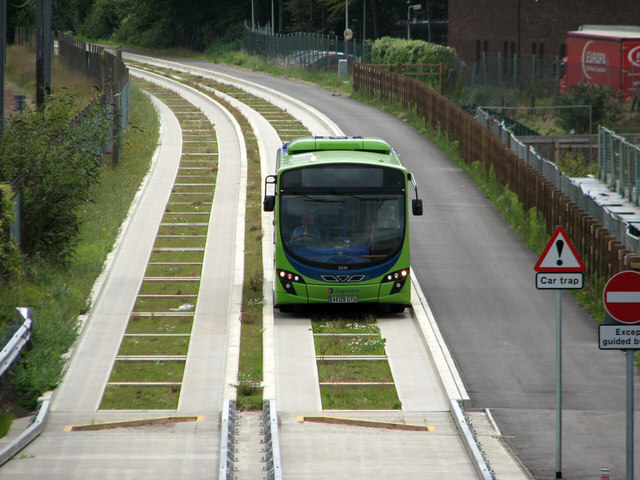 The highlight of the project is the Leigh to Ellenbrook Guided Busway, the first of its kind in Manchester. Services will join the busway from both Leigh, Atherton and Tyldesley before heading towards Salford and Manchester. At the end of the busway, services join the A580 which offers bus lanes and priority at junctions for buses. This is due to open to the general public in Spring 2016 and BRT UK are attempting to arrange a technical visit to coincide with the opening. Oxford Road, synonymous with the Manchester’s Universities, is one of Europe’s busiest bus corridors. As part of the Bus Priority Package, Oxford road is being transformed from a road dominated by car traffic to one which supports and promotes active and shared modes. Bus services will be more punctual and reliable while the introduction of ‘Dutch style’ cycle lanes will ensure cyclists are segregated from busses making it safer and easier for more people to ride along this popular route. The works on Oxford Road are due to be completed in summer 2016 and with the 2016 BRT UK Annual Conference being held in Manchester (TBC) this will make an excellent site visit option. As part of the package, significant investment is also being made in the route between Middleton and Manchester and in the city centre all aimed at improving journey times, service punctuality and making cross city services more viable. You can read more about the Greater Manchester Bus Priority Package here. Cambridge – the UK’s first BRT city? Cambridge is already at the heart of one of the world’s longest Guided Busways but plans are afoot to invest further in the Cambridgeshire bus network. The Cambourne to Cambridge Better Bus Journeys project could see the delivery of a new busway linking key employement sites, with residential sites and existing/new park and ride facilities. Consultation has now come to a close and the next steps will be announced in spring/summer 2016. The key transport routes of the M11, Milton Road, Histon Road and the A1306 between Cambridge and Haverhill are being considered for bus priority measures which may or may not constitute BRT. The A1307 corridor runs alongside a disused railway alignment which could potentially be used for a new busway. The existing busway is also being extended to link with the new Cambridge Science Park Station. Guided sections at the entrance and exit of the 500m stretch will restrict access for vehicles other than buses. The Science Park station is due to open in December 2016 and will demonstrate the flexibility of BRT systems and how easily they can be integrated with other modes, in this case heavy rail. The Government is planning new Buses Legislation which will make it easier for local transport authorities to franchise networks of bus services. This would allow bus services outside London to be provided in the same way as they are in London, and the same way that national rail services are provided. It would give Local Transport Authorities the powers to plan, develop and regulate bus services offering passengers simpler, integrated Oyster-style ticketing and guarantees on service quality. Work to refine the Bill is ongoing but the industry is expecting it to be considered by Parliament in late 2016. For several years Centro and Birmingham City Council have been talking about delivering a ‘bus that thinks it’s a tram’ otherwise known as the SPRINT project. 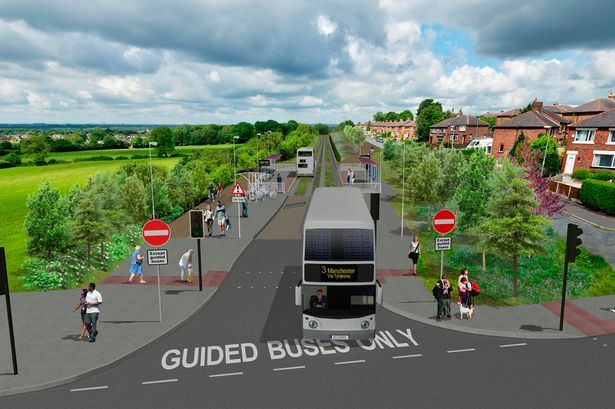 With high capacity, high quality articulated vehicles at the heart of the proposals BRT UK understand 2016 will see the first line, between Birmingham and Quinton getting off the ground. Additional routes are proposed from Birmingham City Centre to the Airport and to the proposed HS2 Interchange. Once up and running BRT UK will be looking to arrange a technical visit to see the vehicles in operation. Work is well underway on various key elements of the Bristol Metrobus scheme. The £200m project involves three routes including Ashton Vale to Temple Meads; Cribbs Causeway via Emersons Green to the city centre; South Bristol link between the A370 Long Ashton bypass and Hengrove Park. Although not due to open until 2017, the bulk of the construction work will take place this year and may make for an interesting technical visit and or item on the 2016 conference programme! Following on from the success of the 2015 conference (click here to read Dave Haskins, Chair of BRT UK’s review) we are now working on plans for the 2016 Conference which will be held in Manchester at some point in late November or early December. We hope to see many of our members there. For more information keep an eye on the Conference page of our website.